With the failure of neoliberal economic reforms by the World Bank and International Monetary Fund (IMF) in the 1990s as a solution to poverty and vulnerability in developing countries, social protection programmes and especially cash transfers have emerged as an instrument for addressing poverty and vulnerabilities in the world. 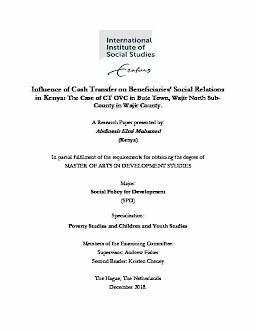 Based on qualitative fieldwork and a critical literature review of relevant government, academic and institutional documents, the study examined the influence of Cash Transfer for Orphans and Vulnerable Children (CT OVC) on social relations among beneficiaries in Kenya. It specifically considered intra-household and inter-household relations that have been affected by the programme. The study argues that the programme had positive effects on household’s social relations by improving female caregiver’s decision making in the household, strengthened household stability through regular and consistent income, boosting caregivers’ self-esteem and confidence, expanding networks and social capital gains for the beneficiaries. It also had unintended adverse outcomes with regard to increased women and girls’ care work burden, reduced male’s contribution to household responsibilities causing conflicts and tensions as well as weakened trust and reciprocal exchange among community members. The study recommends linking the programme with complementary interventions so as to sustain the gains made and mitigate the unintended negative effects.